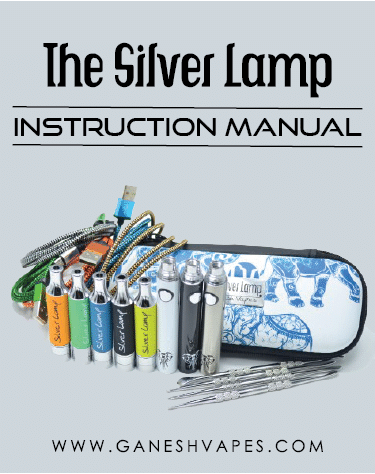 Defying the possibilities of the average wax/oil vaporizer, the Silver Lamp Kit features the latest in technology. Its coil system features Dual Quartz rods wrapped in titanium alloy wiring, and set in a Quartz Bucket. The atomizer housing features an easy-to-use adjustable airflow system, that prevents clogging and allows you to get the perfect hit. The atomizer sleeve features an internal cap and screen that will reclaim products and prevent leakage. The G-go battery is equipped with a smart chip that allows it to fire for 15 seconds and a session mode which will auto-fire the battery with 2 rapid clicks. A convenient micro USB charging port on the side allows you to vape while you charge. I’ve purchased three or four cheap vapes and finally decided to get something a little more substantial I’m so happy with the Silver Lamp. Everything tastes better and everything vapes way more efficiently. Didn’t know what to expect but when it came I knew I would never go back to my Globe. Love it! CAME FAST – CAME FREE! And I absolutely love it! I was a big fan of the original Silver Lamp… then they came out with the airflow and forced me to upgrade! I am glad I did! Hits like a blunt!